This fullcourt zone press traps off the dribble (thumbs up), unlike a regular 1-2-1-1 that traps on the inbounds pass (thumbs down), see Defence - 1-2-1-1 Basics. X4 pressures the ball out of bounds, on the inbounds pass he drops below ball level, and can push X3 back. X2-X4-X3-X1 form a box with the ball on the side. Option - X4 traps the inbounds pass if possible (thumbs down), otherwise drops back into thumbs up. Rick Pitino matchup press - 1-2-1-1 - start with pressure on the inbounds passer, looking for a steal, rotate into the 2-2-1 matchup on a completed inbounds pass. Option - if X4 can see an inbounds pass to 1 in the corner, he immediately traps, otherwise he rotates into his box position. 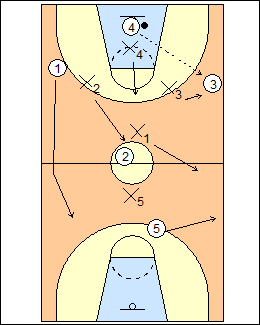 Tubby Smith - X4 forces the inbounds pass away from the middle, then gets back to ball level, and X3 can back up. X2 pressures the ball, forces 1 to dribble, trap if he gets out of control. X1 mirrors the ball on ball reversal. 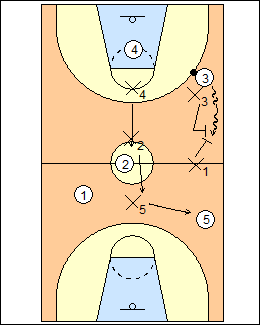 Jim O'Brien - X4 will immediately trap an inbounds pass to the coffin corner, otherwise he drops back below ball level. See Defences - 1-2-1-1 Kentucky (White), White and Black matchup (White), Florida matchup press, Tar Heels scramble. - side fist - trap the ballhandler along the sideline in the backcourt or frontcourt. Doug Porter - Stay press - the initial trap is delayed, the defender pressuring the inbounds pass looks to trap near a sideline as the ball nears midcourt. Pitino - change your presses, e.g., match-up on a jump shot, 1-2-1-1 on a shot inside the paint, halfcourt trap on a 3-point shot. Also change the press if you knock the ball out of bounds (dead-ball situation). Variation - start in a 2-2-1 set with the ball out of bounds. 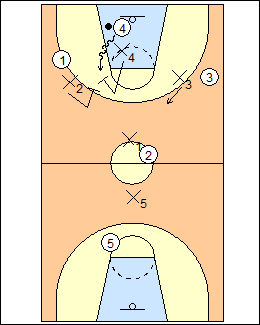 If 3 cuts up the weakside sideline to halfcourt, X3 shifts out to cover a skip pass. See Defences - 1-2-1-1 Kentucky (Black), 2-2-1 Walberg, also John Kimble. 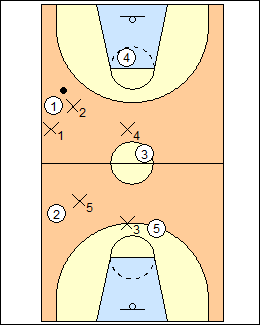 Tubby Smith - used after a made 3-point shot (or X4 is out of position), X4 bumps X3 back to the second line of a 2-2-1, X5 shifts back and protects deep, opposite the ball. Pitino - if 1 passes to 3 in the middle (weak ball pressure), X2 chases looking for a tip, X3 plays middle aggressively, X5 defends the basket, X4 retreats backside, X1 retreats ballside. To take the ball out of 1's hands, you can have X2 and X4 double-team immediately. Fran Fraschilla (ESPN) - 2-2-1 - on the inbounds pass to 1, X4 sinks on a sharp angle to the middle, and X3 is on a sharp angle to X1, ready to play a long diagonal pass over his head. X1 plays in the passing lane on the sideline ("lanes" the pass), ready to trap the dribbler advancing up the side. X2 pressures the ball straight up, X2 and X4 double team if 1 drives up the middle, X1 and X3 are interceptors, X5 is the safety. 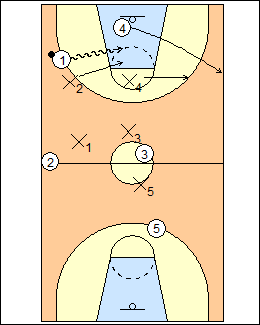 If 1 blows by, X2 and X4 sprint to back tip, other defenders retreat (you will get steals from behind). Pitino - on the inbounds pass, X2 plays 1 straight up and close, encouraging the dribble. Any attempt to dribble middle is immediately trapped by X2 and X4, if 1 gets by the defenders, the ball must be tipped from the rear. Dean Smith (2-2-1) - on a slow dribble, X4 would give ground then sprint to double-team, surprising the ballhandler. Walberg - ball pressure is key, make the ballhandler put it on the floor (an attack dribble), they don't care which way you force, X4 always turn into a trapper. If you run the defence right, you will get more steals from behind (back tipping) than from traps. O'Brien - the ballhandler is pressured hard, don't force sideline, a speed dribble triggers a trap with the nearest defender in the direction of the dribble (don't trap a dribbler who is under control). Billy Donovan - on the inbounds pass, apply pressure, play the ball head up, not forcing side or middle. Jim Calhoun - if 1 gets to the middle on the dribble, X2 tries to back-tip from behind, X4 tries to slow him down, the other defenders retreat. 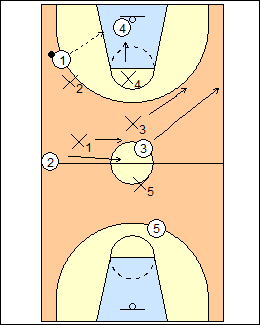 X1 and X2 trap if 1 drives up the sideline, X4 and X5 are interceptors (X4 covers middle, X5 rotates to cover the sideline, the obvious pass), X3 protects the basket. 1f 1 spin dribbles, X4 reads it and attacks from behind. Variation - X3 covers the sideline, see Defences - Billy Tubbs fullcourt zone, 2-2-1 Hubie Brown, also White and Black matchup press. 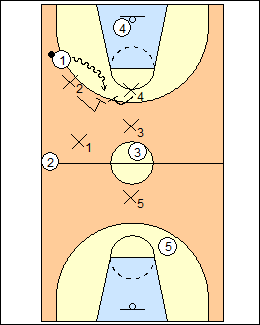 Pitino - X4 reads any spin dribble and attacks from behind. Any uncontrolled sideline dribble is trapped aggressively by X2 and X1, X5 rotates ballside, X3 guards long. When a trap is made, rotate over to fill the position vacated. No traps unless the man is in a speed dribble. Dean Smith (2-2-1) - if the ballhandler dribbles up the sideline, the defence drops back hoping to make something happen around the mid-court line with a double-team of X2 and X1, X5 moves over as interceptor, X3 would be goaltender, X4 an interceptor. Calhoun - X1 comes up to trap when he sees that the ball is in full control by X2. As the ball nears halfcourt, X5 gets closer to the sideline, he mirrors the ball as it is advanced. Fraschilla - the deep man is usually the best interceptor (X3) because he must play sideline to sideline. 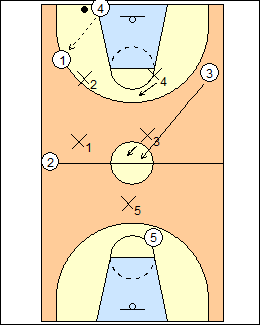 X4 and X5 play the second line so a big rotates to cover the basket. Bruce Pearl - interceptors X4 and X5 are guarding three attackers, they read the passer to position themselves. Donovan - X4 may be able to steal a pass back to 4, but don't give 3 the middle of the floor. O'Brien - X4 is the key defender, he takes away a pass to the middle, the only pass not denied is backwards, all defenders are below ball level. Walberg - X4 looks to pick off a reversal pass if the trailer leaks up the middle, but can't get to it if 4 stays way back. Pitino - X4 plays the middle for two seconds then gambles back for reversal. When a trap is made, rotate over to fill the position vacated. Calhoun - protect middle and strongside, leave open a skip pass, X4 looks for the nearest defender to take away, it could be 4. Greg Kampe - trap if the ball is dribbled or passed into a sideline trap box, see Defence - 2-2-1 Oakland. Pitino - if 1 dribbles middle (laterally), X2 stays with him, go from a box to a diamond, if 1 continues to dribble to the sideline, X2 stays with him, get back into a box. If 1 passes to 4, get back into a 1-2-1-1. Pitino - X1-X2-X2-X4 form a diamond when the ball is rotated to the middle. Dean Smith (1-2-1-1) - move back to a 1-2-1-1 alignment. See Defence - 1-2-1-1 Tennessee. Trap if 4 drives the ball. Tubby Smith - pressure the ball, make 4 put it on the floor, get him out of control. Donovan - if the inbounder can handle the ball they will trap him, if the big is shaky, they want him to dribble and make a play at speed. Pitino - if the inbounder is the other team's center (their 5), the diamond moves back and plays the passing lanes, otherwise the inbounder is pressured, encouraging an uncontrolled dribble. See Defence - Havoc diamond press. If instead 4 passes to 3, form another box, X1 has sideline coverage (but may pause to protect middle until bumped by X2). 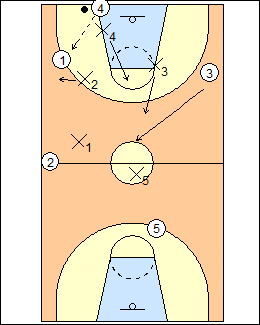 Pitino - a box is once again formed, X3 pressures the ball, X4 helps middle, X1 once again rotates to the sideline and X2 covers mid-court middle. Tubby Smith - on ball reversal, X1 mirrors the ball. Fraschilla - X5 always moves to ballside, he can "shoot the gap" to steal a pass over the second line defender. Brendan Mann - X5 follows the line of the ball. If the ball is reversed with only one pass, the box just shifts from one side to the other, see Defences - 2-2-1 Mann, 2-2-1 UConn. 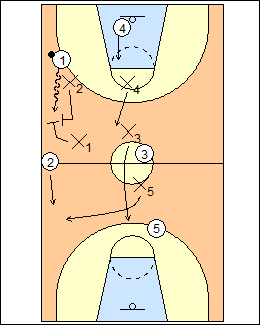 Trap if 3 drives middle or up the sideline. X4 can trap if 3 turns his back. Tubby Smith - X1 does not come up to trap unless 3 is out of control. X3 does not guide 3 one way or the other, play him head up, make him put it on the floor. X4 traps if 3 turns his back. See Defence - 1-2-1-1 basics (trap on the pass to 3). Option - trap again on a pass up the sideline to 5, see Defences - 2-2-1 UConn, 2-2-1 Mann.